When skin begins itching, it can be difficult to get it to stop. 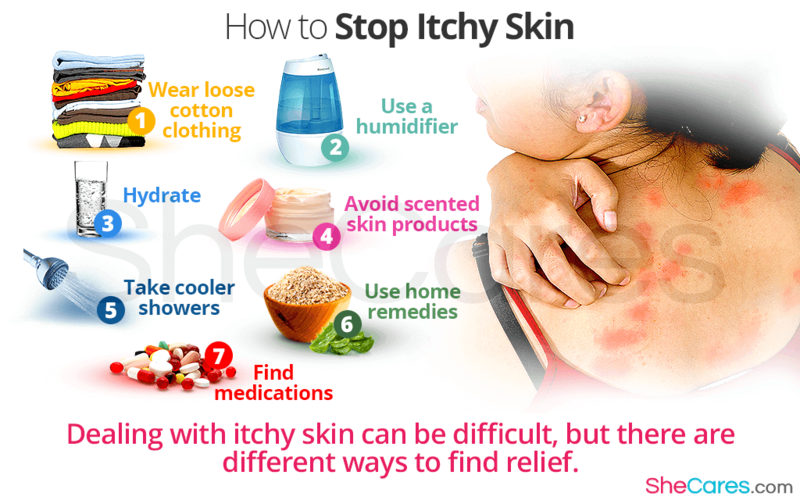 A number of different factors can cause skin to itch, and luckily, there are many ways to take control of the situation again. Particular lifestyle changes can reduce the chances of itchy skin, as well as methods that can stop itchy skin once it begins. Read on to learn what stops itchy skin. Clothing that doesn't irritate the skin is essential to eliminating itching. Clothing made from wool or similar cloths is likely to cause a problem for people with sensitive skin or skin prone to itching, but cotton is soft and non-irritating. Wearing loose clothing keeps anything from chafing against the skin and causing more issues. Dry skin is more likely to be itchy skin, and in the winter, most people suffer from some amount of drying of the skin. To combat this, invest in a humidifier to keep your house from losing moisture in the air. This will help to retain some moisture in your skin, reducing risk of itchiness. Drinking lots of water is another way to keep skin from drying out. Many people drink less than the suggested eight glasses per day, but drinking plenty is a great way to ensure that your organs - including your skin - receive the water they need and don't dry out. The chemicals used to make lotions and soaps smell nice can actually be harsh and irritating on the skin. Many people may not have problems with these chemicals, but for those with more sensitive skin, they can be the source of a lot of itching and irritation. Use fragrance-free alternatives instead. Although hot showers feel nice on a cold day, the hot water actually starts to dry your skin out over time. Plus, spending a long time in the shower does the same thing, so reducing the time and temperature of your showers can help to soothe any itchy skin you're experiencing. Many people suffer from itchy skin, and many people have found solutions - at least temporary ones - to their problem. Oatmeal, aloe vera, calamine, ice packs, and many other natural remedies can help to soothe itchy skin for at least a while. If your itching is too severe to be quelled by any of the previous tips, it may be necessary to visit a doctor for some prescribed medication. Antihistamines, corticosteroids, and other options are available for people with intense itching that will not disappear on its own. Although itching can affect you day to day life, if the above remedies prove insufficient, there are other options to follow that include alternatives therapies and medications.